I use the table to eat on,to use my laptop and to do my bills. It alowes me to set all the way back on the couch. It comes to me unlike other tables that I have used. It is sturdy for what I use it for. I was shocked at one comment that it was hard to put together.What is hard about opening the box, pulling the table out and adjusting the legs and table top to the hight and angle I want? It only takes seconds, with no tools. I have had the table for over 2 years, and I use it everyday. I didn't know about the slide out cup holder till I got it,and what a great supprise. I would recommend this table to any one. I was not really impressed when I first started using this table. It feels flimsy and unstable, but did it's job for my laptop. My entire opinion changed when, in early Jan, I fell full force of 140 lbs into it. My laptop went flying but the table stood strong. My shoulder was not so lucky as I ended up in the ER with a severe shoulder dislocation and bruising of my upper arm bone! I could not believe how well this table stood up to such force. So I give it 5 stars! My shoulder gets 1 star! on it.So easy to set-up. Cannot imagine how I managed without this handy table. It is adjustable and can be used for many things. Have bought for gifts as I like mine so much. Iam disable & I needed a table to get close up to me & this table was the one I have been looking for ! I gave 1 as gift & they loved it started using it right away!! Thank you so much for this table! Use. At bedside for anything I might need during night. Would also be good at sofa or chair for coffee, puzzles or iPad. This is just great for what I use it for. I love it! It fits great by the side of my chair, to place a sundry of items over the days. It also fits well in front of my chair also when I want to eat, or work on a writing project. I use it as a tray for meals because I am on my own. I use it on a slant to do puzzles, and to hold heavy books when I read. 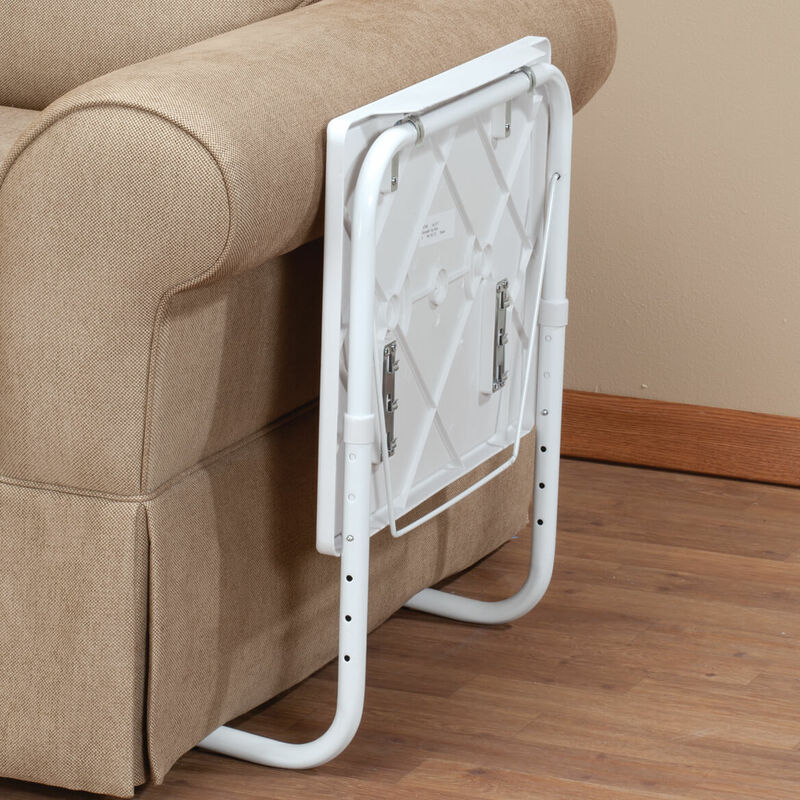 This modernized tv tray allows me to do things on the couch that i couldn't before, because of the legs that can slide under and bring my computer (or whatever) right in front of me as i recline. It may not be pretty but it sure is handy. If i want pretty, i know i will have to pay more. Today, i'm here to buy a 2nd one. We find one isn't enuf! Works really good for my lap top when sitting on the couch. Also good for eating while watching tv. I use this table for meals, my laptop and art. The bar should be stronger as it says. However, I am enjoying the table. I had this table for 4 years. 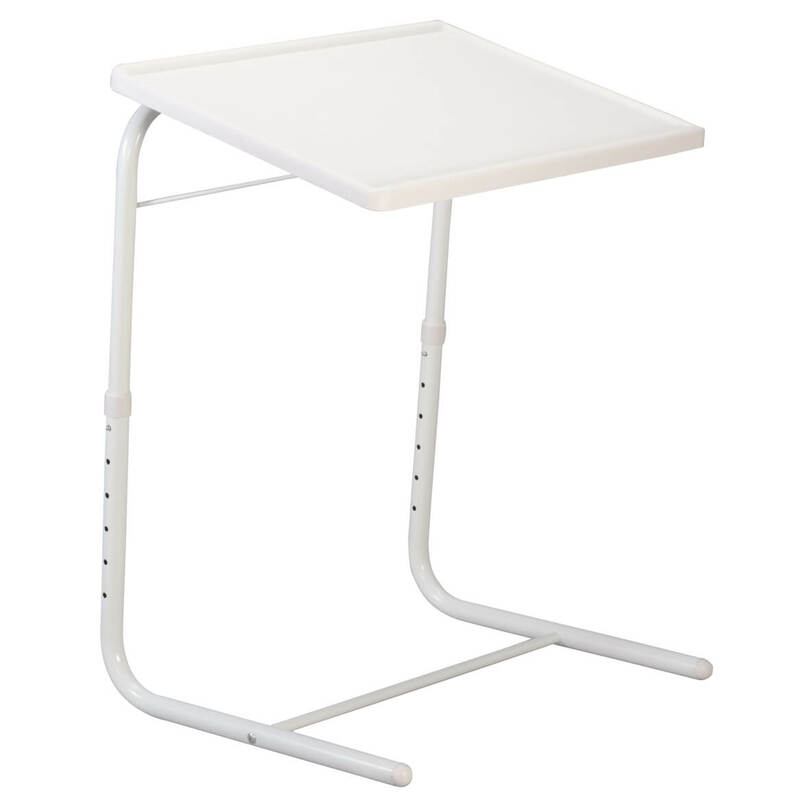 Great for bedside meals, laptop table. couch or chair table. Easy to move around on carpets and floors. It does flatten out with use. Just as stable or unstable as any other tray tables. It's cost effective and adjustable for many needs. This table is a good buy but it can be a litle tippy on carpeting. Good for light sandwiches and snacks. Anything heavier will snap the top off. Also if you rest your armson top it may snap. These tables are not as stable as I thought they would be. These tables are pretty wobbly. One of the pieces that is supposed to help keep it together was broken in the package. They probably will not last long. I was hoping my grandkids could use them for their snacks, but they may be too wobbly. I do like the tray and the many adjustable levels. I do feel the need to warn others that the brace does not lock, so be careful if you lift it to move it. Senior on a fixed budget! For eating watching tv. The tray part could be a little stronger. The product to me isn't worth what I paid for it. At first I didn't think it was going to work for the way I wanted but I tried it in a different position and it will work so I'm going to keep it. I ordered this tray table twice the first one was damaged the second one came and when put together the table top would not sit flat. All lock positions were at some level of elevation. Really wanted this table for a 90 year old. Disappointed! I sent this back. It was a nice table, but it didn't go high enough for me to use it. 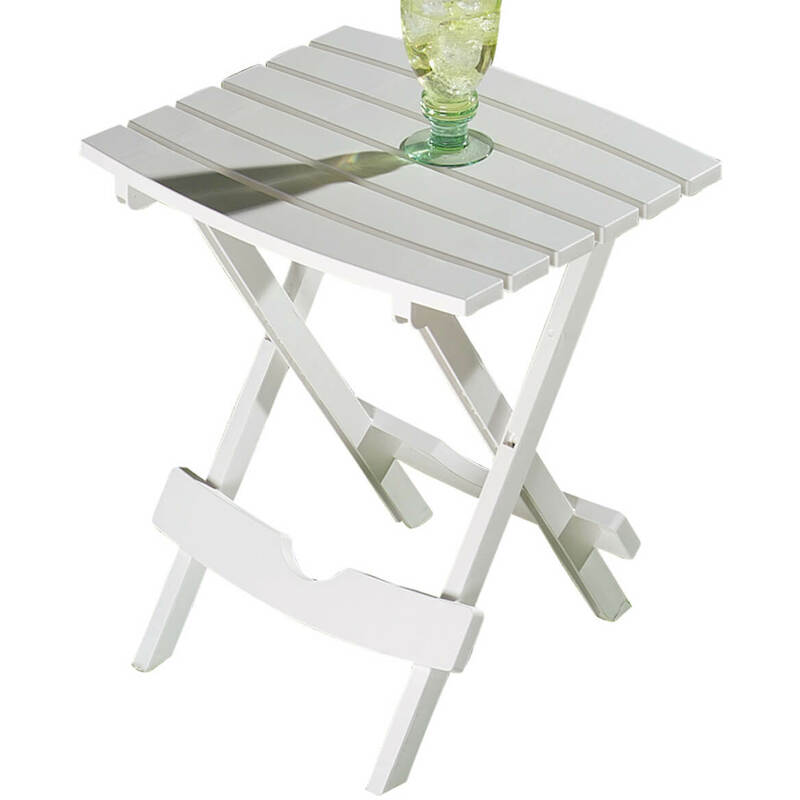 Wanted this for a snack table, but it is too unsteady to use. The company must have tried to keep the price low by making this table not so sturdy. I had one a few years ago and it was made a lot better than the one I ordered and sent back. No matter what setting it never was level. Comes apart too easily,so I can't trust that it won't fall apart while in use. The picture on the box is misleading, you cannot eat while sitting in your chair with out your food sliding off the table. The legs are wobbly I am sorry I didn't read the reviews first DO NOT WASTE YOUR MONEY!! OMG I just tried to use ups and usps to create a shipping label to return this item... wow! 37.64 via ups and 29.92 via the post office. PLEASE PEOPLE DO NOT WASTE YOUR MONEY because in the end here, it's not even worth it to send it back. I'm throwing this piece two actually in the trash.. it's not even worth scrapping any part of it. One of the hooks broke off immediately and will not take the super glue. 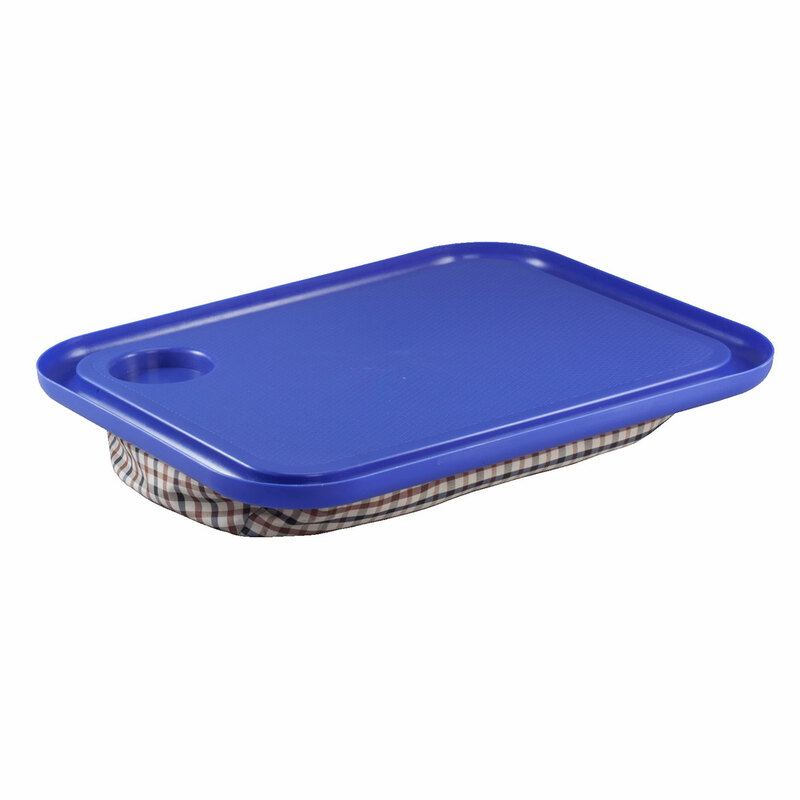 The tray is uneven and it is not sturdy enough to eat off of or even to move around. I have learned a lot about shopping. This advertising is a fraud. Cannot put it together. Instructions not very clear. This table is not all it is advertised. I've had it approximately 2 weeks. The adjustable bar that slips into clips doesn't have the right adjustable choices. Two of the clips have broken pieces after only 5 uses. I take it down after each use because I don't need it up all the time. Very wobbly. I am trying to find something to attach to the table to put the table at the angel I need. I have another tray table that I have purchased from another company. I was placing an order from the Walter Drake catalog and saw this table. I wanted another one of these tables because they are useful. When putting the WD table together, I immediately knew the quality was not good. I gently picked up the table to bring it to where I was going to use it, and it fell apart. Not worth the money I paid for it. Wasted my time and money. Very disappointed in this product, never received such a poor item. The lags are wobbly. Not made good. Waste of money. Don't buy this. Sorry to say, this table is junk. It won't even stay together, I wish I had not bought it. These are flimsy, poorly made, and I wouldn't trust them to support my granddaughter coloring book,let alone a meal.I am returning them. This was not as shown at all!!! The table was poorly constructed wobbly and not useable. It couldn't safely hold a glass of water and on the level that should have been flat was still at an angle. A complete waste of money! Beyond disappointed. It is pretty flimsy. I was looking for a table to put my drinks, like coffee in the morning, on. I'm having back surgery and was hoping to use this next to my couch. Not happening! Can't get it to sit level at all. Had one already. Wanted to get more while I could as it has proven useful so far. it's easier to eat with in your home. Wife in wheelchair. Looks like its lightweight and versitile. It gives me what I want for a lot less money! They are a much needed addition to my small apartment. I want to use it for my small laptop just like in the picture. Wanted something reasonable to write on and have a lap table for hobbies. To use while watching tv. I really like this table. Will be used when I have company to put snacks on. To hopefully use in front of a recliner for my husband who had a stroke. He needs to do tasks directly in front of him. I have the other shelf shown in your catalog, but it does not lower enough to eat from, sitting in my low couch. I use the one I have , to work on my laptop computer. I hope this lowers enough to use while sitting in my low couch. It does look flimsy, not too sturdy. The fold up feature is a plus for me. I chose it for My Wifes Laptop Computer. Sometimes I can't get around too good and it will be more convenient for me. I have one now and it is starting to droop on me. I use it for my computer. my wife needs a table over chair to study bible, she is 84 years old. My parents are elderly and in assisted living. Sometimes they have to eat in their room and I thought this would come in handy for those times. This will come in handy while, coloring, reading, having a snack, etc. Want to use for laptop computer . Need a table that can be brought closer. 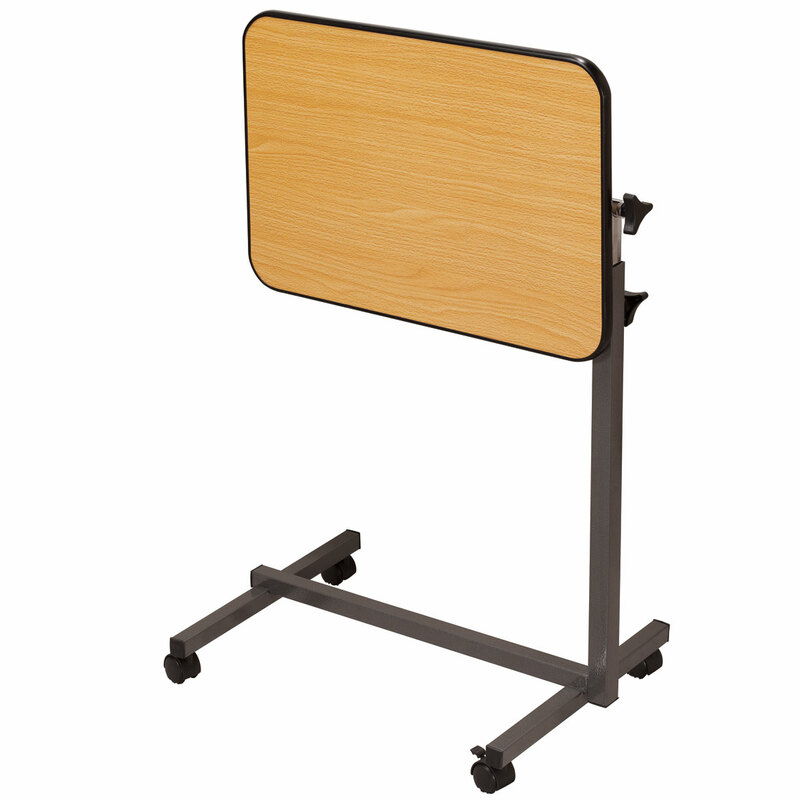 Regular TV trays are prevented from being brought closer by the scissor type legs. Hope this works & is study enough. this Item comes very handy, even as a temporary computer desk while traveling. I have been wanting one of these tables for a long time. To use my laptop computer on in my den. BEST ANSWER: Thank you for your question. We do ship internationally and Egypt is one of the countries we ship to. When checking out all you will have to is select ship internationally and then select Egypt. We hope this information will be of help to you. Is this table wheelchair user friendly? BEST ANSWER: Although it has not been used with a wheelchair, I believe it would work just fine with one. how far will the table tilt? BEST ANSWER: it has three different tilts . Can you show me the three angles? BEST ANSWER: Sorry, I can't send photos of different angles because I use it as a night table in my bedroom and I have a lot of things on it! Believe me you can adjust height and/or angels! It is a great buy!! The tray is awesome. It is well worth the price. You can use it for a lot of different things. What are the different heights it adjusts to? BEST ANSWER: Thank you for your question. Each adjustment lowers it by 1 1/2". The item starts at 26" and the other heights are 24 1/2, 23, 21 1/2, 20 and 18 1/2". We hope this information will be of help to you. BEST ANSWER: Thank you for your question. 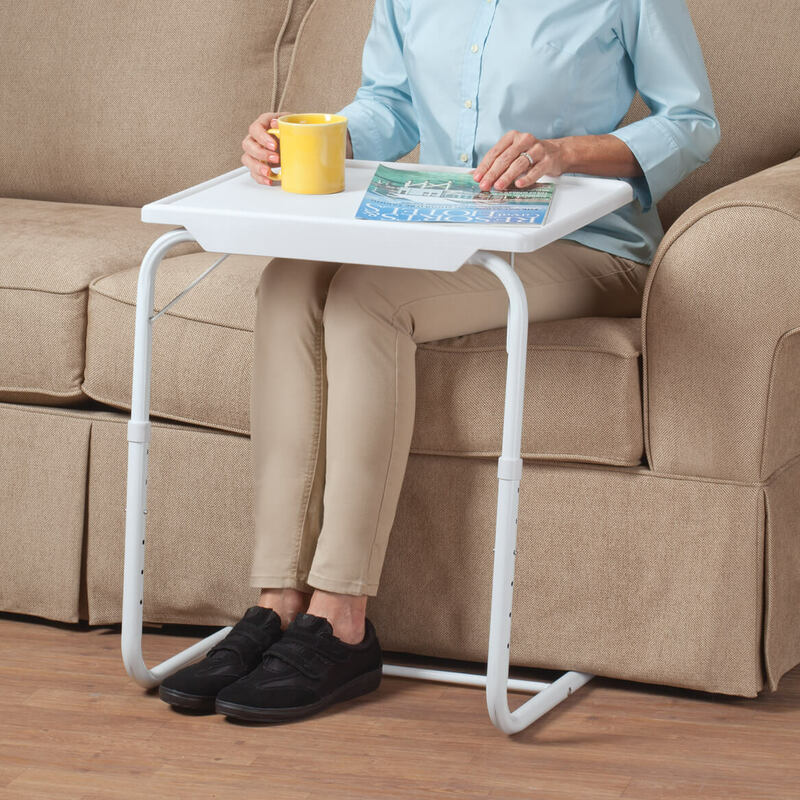 The tray table is adjustable, choose from 6 heights and 3 angles. We hope this information will be of help to you.